Welcome to a complete guide to the best toys for golden retrievers. If you’re lucky enough to own one of these gorgeous dogs, you’ll know that they’re lively guys who love to play! But how do you choose the best toys for golden retrievers? Well, that’s what we’re going to talk about. So, what makes a great golden retriever toy? What makes the best toys for golden retrievers? According to a study that was published in the journal “Animal Cognition,” there are certain aspects of play that explain why particular types of retriever toys appeal to the breed more than others. The study found that dogs look at toys in the same way that wolves look at their prey. If the toy tastes good, can be ripped apart, and/or makes a sound like something squealing in terror, it will be at the top of their “play-with-the-prey” list! Just like you, your pup will find something new far more interesting than a tired old toy they’ve already chewed to death. So, there’s always room in your pup’s toy box for new additions! On a more serious note, it’s a good idea to carry out an audit on your dog’s toys from time-to-time. Throw out any damaged toys that could cause injury, and wash any that have become grubby. Toys that live outside should be washed at least weekly with a mild antibacterial product to get rid of bacteria or worm eggs that could have been deposited by snails and slugs. Your golden retriever will be far more interested in his toy if you join in the game. Think about it; a ball becomes much more exciting if you throw it, and your pup gets to chase down the “prey” while it runs away squealing! Will you use the toy outside or inside? How often will your dog play with the toy? This applies to treat-containing toys where overindulgence could cause you pet to become overweight. How much space do you have for play? If you only have a small house or yard, there’s no point in buying chase toys that need lots of room to be effective. You’ll also need to consider the kind of play your golden retriever most enjoys. Some dogs love tugging, others like squeaky toys, chew toys, or soft toys, and some love nothing more than chasing a ball; your choice of toys will largely depend on your golden retriever’s personal preference! Golden retrievers are large dogs. If your dog has destructive tendencies, you might want to consider buying indestructible dog toys for him so that you don’t spend a fortune continually replacing toys that he’s destroyed. Nina Ottosson Outward Hound Dog Puzzle Toy. This is a very clever idea that will keep your treat-loving golden retriever occupied for hours. The golden retriever is a highly intelligent breed and loves a challenge, making this the ideal toy. You can also use the toy as part of a training regimen. 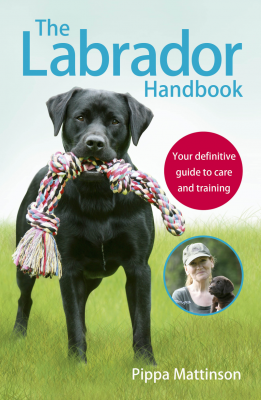 Teach your dog to sit and wait before he’s instructed to go ahead and search for the treats. The toy is made from tough, hard wearing plastic that won’t fall apart. It should be noted that although this is a brilliant toy, it is only suitable for supervised play, as there’s always a risk that your dog could try to swallow one of the blocks. Tumbo Tugger Outdoor Hanging Doggie Bungee Rope Toy. This is perfect if you have lots of outside space for your dog to play in. The Tumbo Tugger is also one of the best golden retriever toys for chewing. Golden retrievers are traditionally working dogs and typically have lots of energy to burn off. This tug-of-war toy is ideal for giving your pet a good cardio workout and for between walk exercise sessions. The bungee rope has a “quick connector” that allows you to change the toys your golden retriever can play with, preventing boredom. The KONG Jumbler Football Toy. This is a really simple idea that gives a traditional fetch game a wonderful new twist. The outer football contains a tennis ball, and the toy also emits a loud squeak, guaranteed to keep your golden retriever interested. The clever handle design allows you to easily pick up the toy and interact with your dog. The material is very hard wearing, making the toy ideal for large dogs who love to chew! iFetch Too Interactive Ball Launcher for Dogs. Most golden retrievers love to chase and fetch. The clue is really in the name, “retriever!” If you have a larger budget, you might like to invest in this toy. 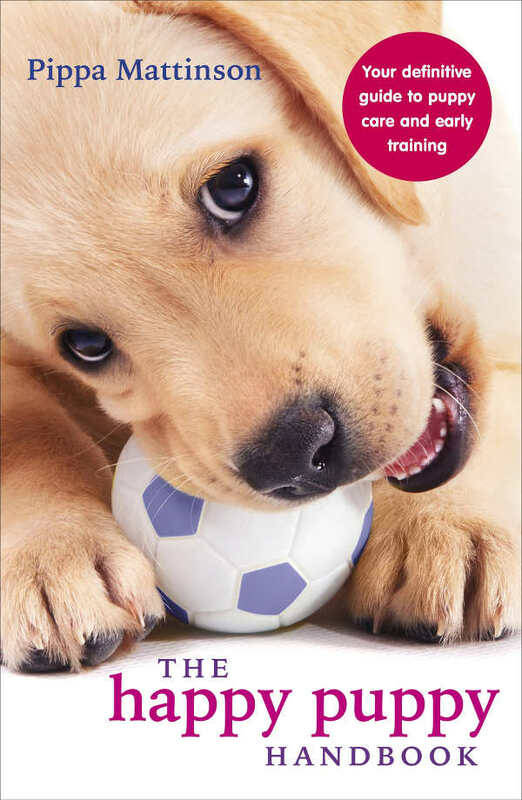 Do you find yourself throwing the ball over and over again for your golden retriever until your arm is aching? Well, this clever product means that you won’t have to see your dog’s disappointment when the throwing game is over. The machine is quick and easy to reload; in fact, your golden retriever could do it himself with a little training. Full-size tennis balls are used, making this throwing machine ideal for a large dog. Golden retriever puppies lose their milk teeth between 14 to 30-weeks of age. Shedding the teeth makes your puppy’s urge to chew on anything and everything virtually insatiable! Unfortunately, puppies are not fussy about what they chew, and this can include your furniture, door frames, and your fingers! As fellow dog owners, we feel your pain! That’s why we’ve chosen some of the best toys for golden retriever puppies to save your home from destruction. There are a few things to bear in mind when choosing suitable chew toys for both golden retriever adults and golden retriever puppies. 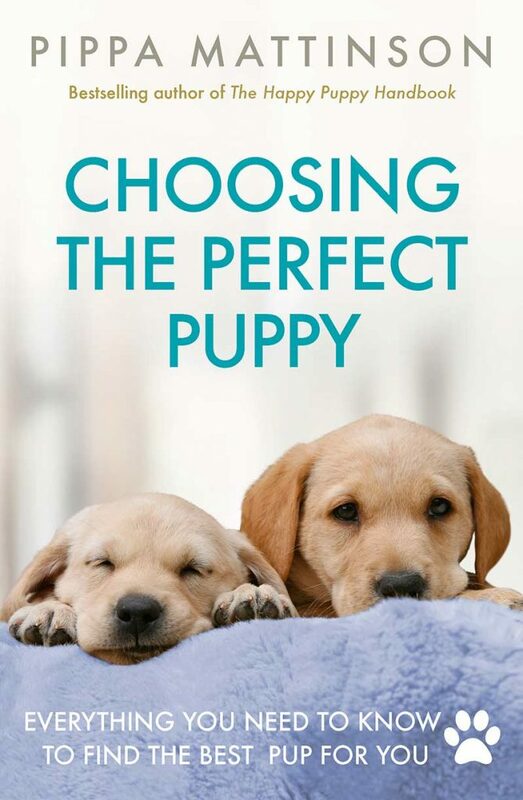 Soft toys should be considered, especially for puppies. Soft toys are ideal for sensitive and sore gums, allowing your pup to satisfy his chewing urge without hurting his mouth. Also, dogs need to feel that they have won when they bite down on their “prey.” If the toy is too hard, it won’t feel realistic. However, look for soft chew toys that are double-lined and have minimal filling. That way, if your dog does manage to get through the outer layers of fabric, there won’t be too much filling to spill out from inside the toy. Never choose a toy that could easily break into pieces or shatter when your puppy or adult dog chews it. Tiny pieces of plastic are easily ingested by gnawing pups and could cause serious injury to your pet. In a similar vein, do not give your puppy a very small toy that could be swallowed. You need eyes everywhere when you have a puppy in the house! 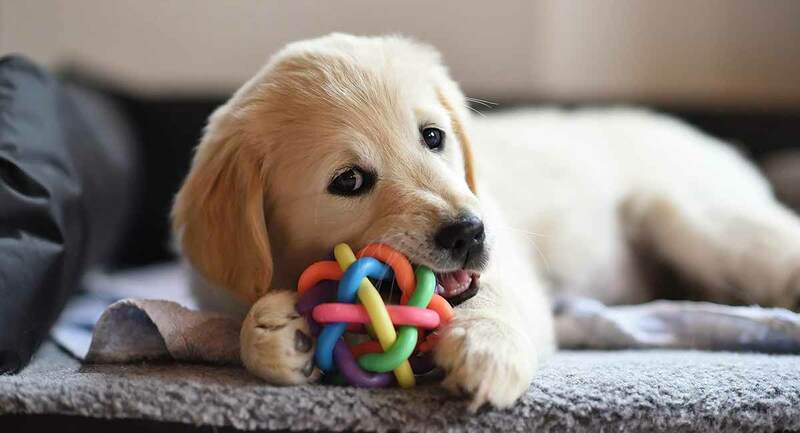 They’ll eat anything they can get their teeth on, so be aware of this when choosing toys for your golden retriever puppy and always pick something large enough for him to play with safely. Kong is a well-known US maker of dog toys with a great reputation for producing safe, durable, and high-quality products. Kong’s “Marvin the Moose” plush, soft chew toy is a big hit with purchasers on Amazon, being one of their best-sellers. The toy is double-layered for extra strength and has a squeak to keep your pup busy and entertained for hours. Marvin is very reasonably priced so if your pup does manage to shred him, it won’t cost you a fortune to buy your golden retriever puppy another victim! The Benebone Real Flavor Wishbone Dog Chew. This toy looks like a real bone and smells like peanut butter! The wishbone design is very easy to grab hold of and bite and gives your puppy all the satisfaction of a bone, without the danger of picking up splinters or suffering from tummy upsets. KONG PUPPY Durable Rubber Chew and Treat Toy. We’ve already featured one Kong toy in this article, and here’s another best-seller from this maker that dogs love. The KONG PUPPY Durable Rubber Chew and Treat Toy is a tough rubber toy that your puppy can chew and gnaw to his heart’s content without any danger of the toy breaking or shredding. For added interest, you can stuff the toy with treats or peanut butter to encourage chewing or to provide an incentive in a game of fetch or for training. If your puppy is teething, try freezing the toy with food inside it to provide a soothing, cooling effect for the gums. The toy has a wonderfully unpredictable bounce when it hits the ground to keep your dog interested and intrigued. Kong’s chew toys all come in a variety of sizes, so there’s a toy suitable for any golden retriever, whether he’s a puppy or a full-grown adult. Puppy Starter Packs Puppy Chew Toys. Another top industry brand and renowned maker of durable and safe chew toys is Nylabone. Their Puppy Starter Packs Puppy Chew Toys contains three bone-shaped chews that are designed for different teething stages. There’s a rubber bone with a textured, bobbly surface that your golden retriever puppy can chew in comfort. The bobbles help to remove plaque from your pup’s teeth, preventing the formation of tartar and keeping your puppy’s teeth clean and healthy. Then there’s a smooth bone that’s temptingly flavored to encourage your pup to chew the toy and not your furnishings! The third bone is an edible hide treat, flavored with lamb and apple. 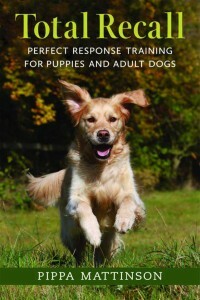 Golden retrievers are lively, intelligent dogs who love to play, especially when you join in the game! When choosing toys for your golden retriever, remember to pick something that won’t shatter or break. Soft toys can be given to your golden retriever, but do watch him to ensure he doesn’t tear the toy and eat the stuffing! When golden retriever puppies are teething, toys are important to satisfy their natural chewing urge. Pick a toy that isn’t too hard, as this could be too harsh for sensitive gums. Do you have a golden retriever? If you do, what are his or her favorite toys? Tell us about your best toys for golden retrievers in the comments section below!